If you’re seeking somewhere to settle down and raise a family, or simply looking to get away from the busy hustle and bustle of central London, you may have considered moving to Richmond. Not only has this tranquil borough been ranked London’s happiest area, it also boasts a wide range of amenities and attractions, along with some excellent transport links into the city centre. Richmond is home to some top rated London restaurants, with prices to suit everyone. For a fine dining experience, The Glasshouse in Kew is a popular choice, specialising in French, European and British cuisine. Or if you’re looking for more of a cheap eat, Pizzeria Portofino is considered one of the boroughs hidden gems, offering freshly made pizzas and cooked breakfasts at a reasonable price. 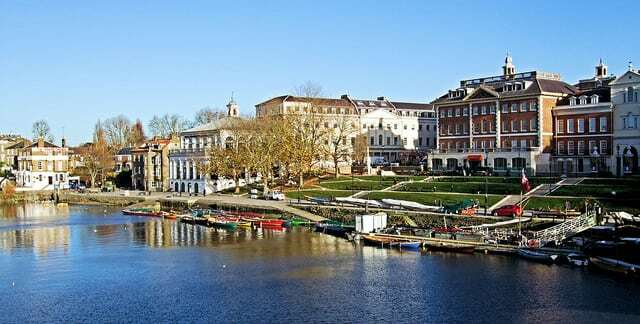 Although not as lively as its central London counterpart, Richmond nightlife has many options. Bar One is great for enjoying some cocktails with friends, while the Victorian White Cross pub is the perfect spot for a relaxing riverside drink. You don’t have to worry about venturing into central London to get some shopping done, as Richmond is full of a great selection of stores. Health conscious residents can benefit from the neighbourhood’s whole foods store, along with the Richmond farmers market every Saturday, giving the opportunity to support local farmers and independent food producers. You need not rely on the city centre for a quality haircut either, with plenty of great Richmond hair salons offering both hair and beauty services you can count on. Fashion lovers can enjoy a spot of retail therapy at Vintage Rose, an independent boutique that sells a mixture of second hand gems and designer pieces. Richmond is the perfect place for a picturesque day out. The wide range of attractions can leave you spoilt for choice, from visiting the historic ham house to admiring some art at the Marianne North gallery, hidden away in Kew’s beautiful botanical gardens. Richmond park is another spot not to go amiss, especially for nature lovers. Hailed the largest park in London, it’s the perfect place to take a relaxing stroll and see some of the deer that walk freely around the reserve. As with all London boroughs, the cost of living is higher than average compared to other UK cities. Buying a home in Richmond could set you back over 1million for a semi-detached property and around £800,000 for a terraced. Renting in Richmond is relatively less pricey, with the average rental price of a 4 bedroom house at around £3,000, less than some other suburban London areas.